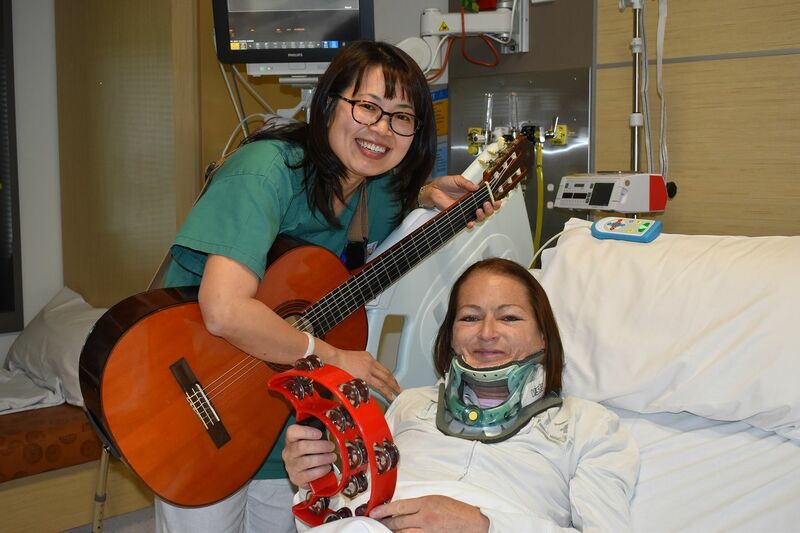 A new program at the Royal Adelaide Hospital is using music as an instrument of healing, with patients creating, listening and enjoying music while working towards physical and psychological goals. The music therapy program is a Centre for Creative Health initiative, funded through the University of Adelaide and The Hospital Research Foundation. Dr Patsy Tan is an American Board Certified Music Therapist as well as Australian Registered Music Therapist. She is also a certified neurologic music therapist and NICU therapist. “Music therapy is an established allied health profession whereby music is used within a therapeutic relationship to help patients in their psychological and physiological needs,” Dr Tan said. “It is also often used in co-treatment sessions with other health professionals, so if for example a physiotherapist says a patient needs to walk certain steps per minute, we would align that with the beats per minute in the music. “Music therapy is about supporting patients. It is motivation towards treatment during a critical period. Dr Tan explained that music therapy was tailored to the needs of the patient, as well as the health professional. For example, a stroke patient taking part might benefit from having an instrument on the left hand side, to encourage movement on that side. The music patients play, or listen to, is based on what music they like and for patients in rehabilitation the tempo of music is based on what the physiotherapist or occupational therapist prescribes. Dr Tan plans to undertake research at the RAH (subject to ethics committee approval), looking at whether music therapy reduces the perception of pain and anxiety of post-stroke patients. Michelle Cripps, Director of the Centre for Creative Health at the Royal Adelaide Hospital, said: “We are delighted to be working with Patsy and the Adelaide University in introducing music therapy to the RAH and adding music therapy to the Centre’s Arts in Clinical Care program”. Dr Patsy Tan with RAH patient Bobby-Jo.